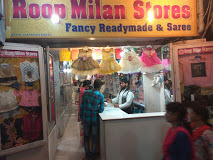 is available roop milan stores is customer satisfication stores. Roop Milan is best store that i have experienced in my fashion for shopping product.Its have major types of clothes . Its have best servies to our clients statiufaction. Its have also major typs of casual, fashion & estern, western culture fasion products.